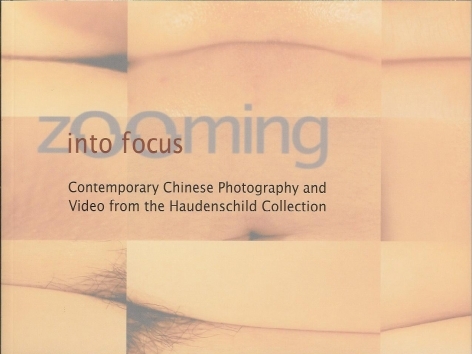 The exhibition's lead title, Zooming into Focus: Contemporary Chinese Photograph and Video from the Haudenschild Collection (2003 - 2005), refers to three major concepts quintessential to the exhibition and the symposium: Chinese artists' use of photographic and video camera to examine the quick transition in their culture, the incredible pace of growth in China's urban centers, and the current attention being paid to China by the rest of the industrialized world, especially the West. Most of the artists represented in Zooming into Focus live and work in China's swiftly expanding southern megalopolises and frequently address those issues that directly affect young urbanites - the social impact of burgeoning consumerism, the meteoric rise of youth culture, the threatening loss of identity amidst the city swirl, the persistent sense of time speeding by. "The exhibition presented an invaluable opportunity to bring to Southern California work that would not otherwise be shown in the region. 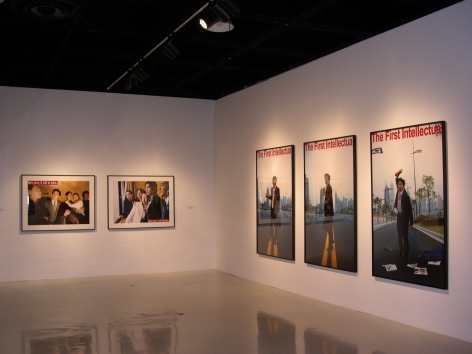 The project was groundbreaking, as it was the first exhibition to feature the current generation of Chinese photographers and videographers. 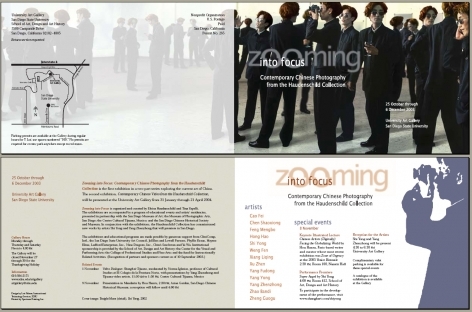 The artists' residencies were extremely significant for the University, as they provided students the incredible experience of working with two of the artists, Yang Zhenzhong and Shi Yong. 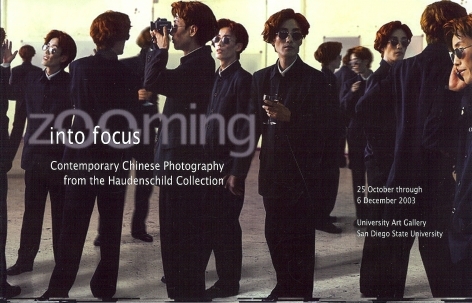 In the case of Yang, students were involved in the creation of a new work commissioned by the haudenschildGarage, which premiered at the Museum of Photographic Arts, San Diego. The project was also important because it created a network of collaborations with institutions in San Diego, Tijuana, Shanghai, Beijing and Singapore. Organized by Tina Yapelli and Eloisa Haudenschild. Chinese Video and Film NOW! 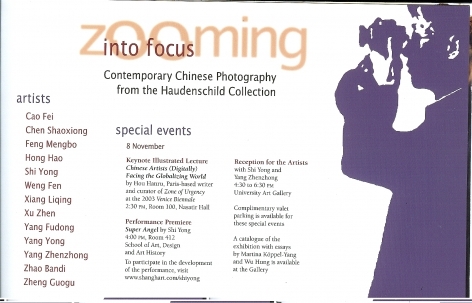 Introduction by Christopher Phillips; Yang Fudong present in cooperation with the Museum of Modern Art, New York. 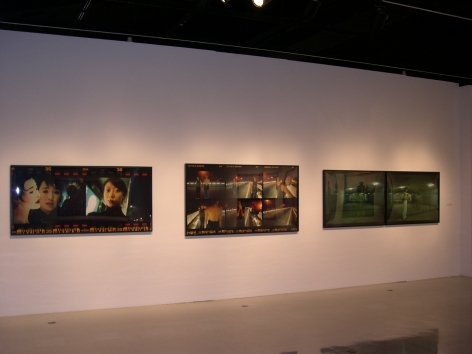 The works screened included Song Dong's My Motherland Made the Scene for Me, 1999; Wang Gognxin's Fly, 2000; Yang Zhenzhong's I Will Die, 2003; Cao Fei's Rabid Dogs, 2002; and Yang Fudong's Seven Intellectuals in Bamboo Forest (Part I), 2003. Let's Pray was commissioned by the haudenschildGarage and filmed during his residency at the haudenschildGarage. It was produced in association with the University Art Gallery at San Diego State University. 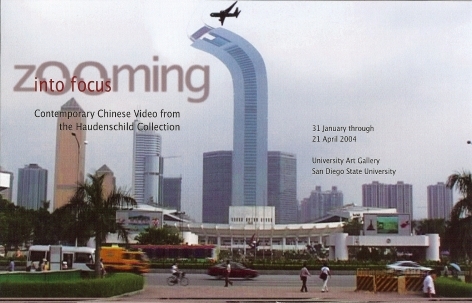 Shanghai artists Shi Yong (November 3 - 10, 2003) and Yang Zhenzhong (October 22 - November 12, 2003) were in-residence at the haudenschildGarage; they were commissioned to produce new work. Yong's residency concluded with his performance of the interactive piece Super Angel at San Diego State University. 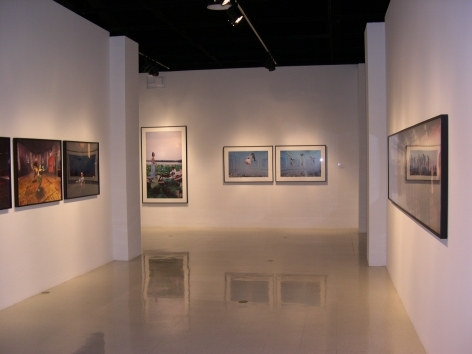 Zhenzhong's residency culminated in the premiere of the commissioned work Let's Pray at the Museum of Photographic Arts, San Diego. The haudenschildGarage helped produce and supported Zhenzhong in filming the English and Spanish segments of his piece I Will Die (English, Spanish, and Chinese) while in San Diego and Tijuana. 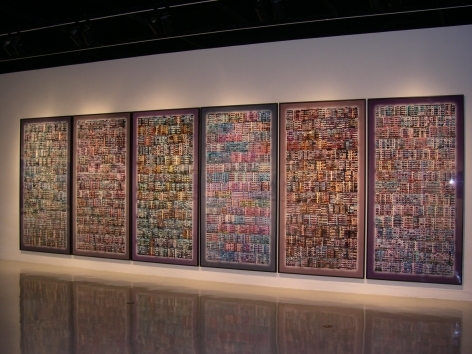 I Will Die was later selected for the 2007 Venice Biennale. Super Angel was commissioned by the haudenschildGarage; Shi Yong worked with San Diego State University students. 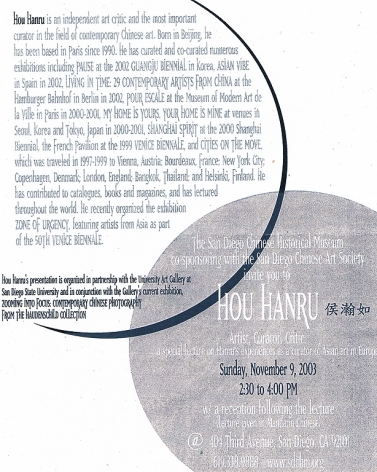 Hou Hanru, Paris-based writer and curator of Zone of Urgency at the 2003 Venice Biennale, was the keynote lecturer at San Diego State University and the San Diego Chinese Historical Museum where he presented Chinese Artists (Digitally) Facing the Globalizing World. This event was moderated by Norma Iglesias and included presentations by Yang Zhenzhong and Tijuana artists Itzel Martinez (Yonkart), Giancarlo Ruiz, and Salvador Vazquez Ricalde.